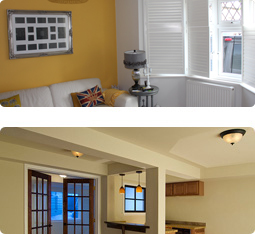 We offer a first class painting and decorating service in Watford and the surrounding areas. Many of our customers have benefited from having the plastering work done, whether its internal or external, then the painting completed by us too as it saves, time, money and effort on their behalf. We offer top quality painting and decorating with competitive rates that includes excellent work standards and agreed timescales that are achievable. As a result, we have many satisfied customers who use us time and time again. We are fully experienced in all aspects of painting and decorating and can offer a complete solution to any painting and decorating requirements. If you would like us to provide you with a free, no obligation quotation please call us on 01923 244 725 or 07903 504 174.